What do you see in this picture of Joe Maddon? For one IoTer, it's a two-time AL Manager of the Year. For the other, it's a .500 manager with a losing playoff record. 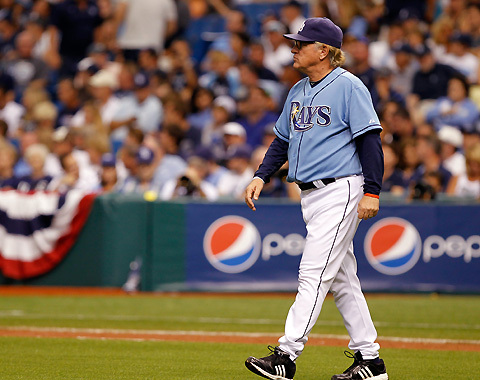 Jeremy: Bad news for you: The Rays are about to sign Maddon to a 3-year extension. Jimmy: Good move. When you’ve got a chance to lock up a guy with an 11-14 career playoff record, you have to do it. Jeremy: If you want to talk playoff record, doesn’t that make the Rays’ win in the ’08 ALCS look worse for the Red Sox? Jimmy: It does. But 2 World Series titles look much better. Let me know when the Rays win something. Jeremy: Remember the 2011 Wild Card? Or how about the 2010 AL East? Jimmy: Do they get rings for those now? Banners, maybe? How quaint! Jeremy: To quote “Moneyball,” the playoffs are a crapshoot. The Rays have been a better team than Boston over the long haul of a 162-game season in three of the last four years. Jimmy: Red Sox (’08-’11): 369-279. Rays (same time): 368-280. The Red Sox have been better over the entire period. Since the playoffs are a crapshoot and all. Jeremy: And yet in three of those four years, the Red Sox were looking up at the Rays in the standings. Jimmy: Isn’t it a little too convenient to start this sample at the precise moment the Rays became good? The second after boston won its most recent World Series? Why are Maddon’s first 2 seasons (127-197) not relevant? Jeremy: Maddon’s first two seasons aren’t relevant to his contract extension because he (and the current ownership) inherited a mess of a franchise. It took time to implement their system. Jimmy: Pythagorean wins since 2008, if you want a better measure of actual quality: Boston 376, Tampa 368. Luck is the biggest difference between the Sox and Rays since 2008. Jeremy: You call it luck; I call it good managing. Jimmy: Just saying: it’s awfully convenient to omit 2007. YOUR TRASH TALK IS SENDING ME TO THE DARK SIDE! Jeremy: You can join the Red Sox there. They crossed over a long time ago. Jimmy: Why? Because they spend money? Jeremy: Because they’ve become entitled. They’re like the Yankees now. They view winning a World Series as their birthright. And yes, because they spend an ungodly amount of money. Jimmy: Which Red Sox feel this entitlement? Jeremy: Ownership. The fans. The starting pitchers who were dining on fried chicken and beer during games. Jimmy: Oh please. Who cares what players who aren’t playing do in the dugout? Jeremy: I know it’s difficult for you to accept that your team has become the thing you hate. Give in to the power of the Dark Side. Jimmy: Again, let me know when the Rays actually win something. Until then, they’re the poor man’s A’s. This entry was posted on Wednesday, February 15th, 2012 at 9:00 pm and is filed under Baseball. You can follow any responses to this entry through the RSS 2.0 feed. You can leave a response, or trackback from your own site. Jimmy wins logic; but Jeremy wins the heart-tug argument. Which is what sports is all about.